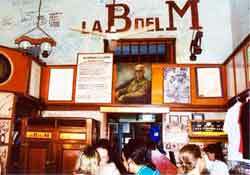 Since Wednesday, Mar 10, Cuban traditional cuisine-loving Lebaneses and tourists are able to indulge in the subsidiary of the famous La Bodeguita del Medio restaurant (BdelM), the first such franchise in the Middle East opened in Beirut, Lebanon. The facility was inaugurated in a ceremony attended by Lebanese Tourism Minister Fadi Abboud, Cuban Ambassador Manuel Serrano and Director of Franchises of the Extra-hotel Business Group Palmares S.A, Antonio Planas Gomez. Cuban diplomatic sources in Beirut told Prensa Latina that at least 300 people enjoyed Cuban music performed by Café Amargo group during the opening ceremony led by BdelM director Raudel Travieso Perez.